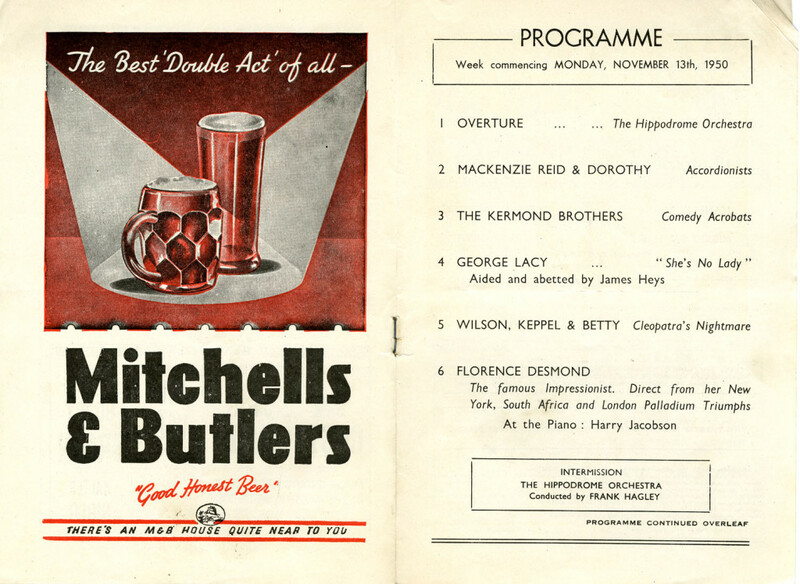 This programme shows a typical variety bill. 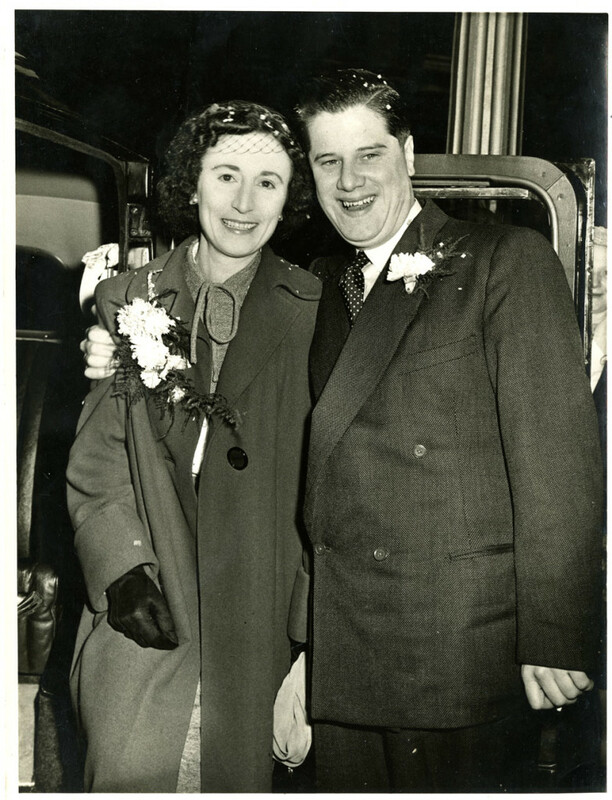 The show featured George Lacey a popular pantomime dame and American impressionist Florence Desmond. The comedy act Wilson, Keppel & Betty who had become popular in the 1930s also appeared. The trio (with a series of different Bettys) were famous for their act ?The Sand Dance? inspired by Ancient Egypt and the discovery of Tutankhamun?s tomb. The couple met in the late 1940s while working at Birmingham Hippodrome. Bob was the Chief Electrician and Connie an usherette. According to their son, Bob used to try and get Connie?s attention by shining a spot light on her! The pair collected many autographs from their favourite stage performers. 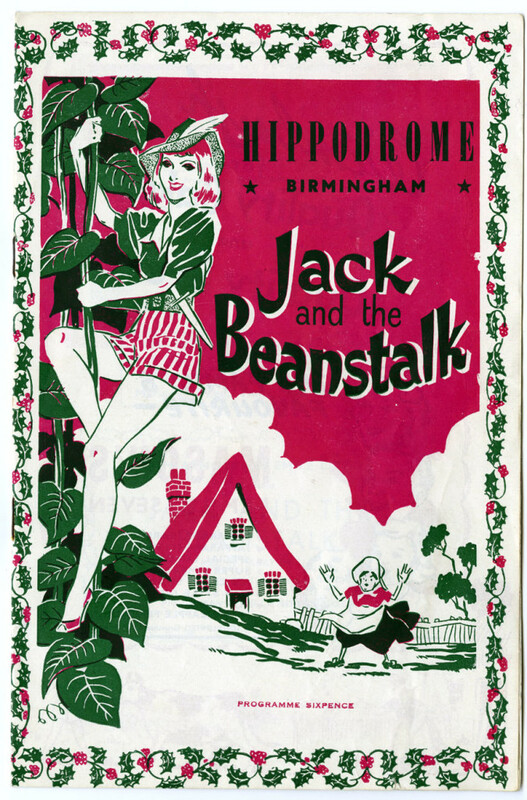 Birmingham Hippodrome staged its first pantomime in 1957 staring Beryl Reid, Reg Dixon and Freddie Frinton. 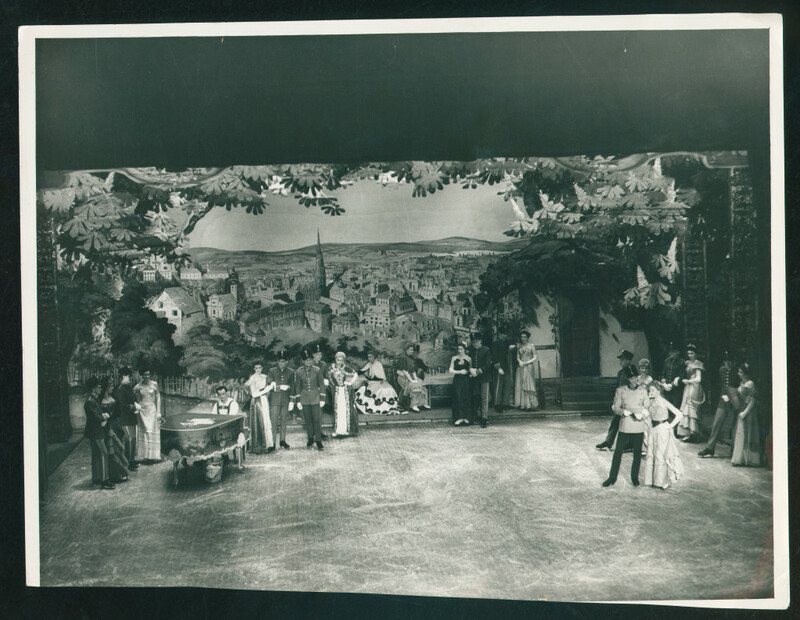 The pantomime had been due to show at the Theatre Royal on New Street before the theatre closed. 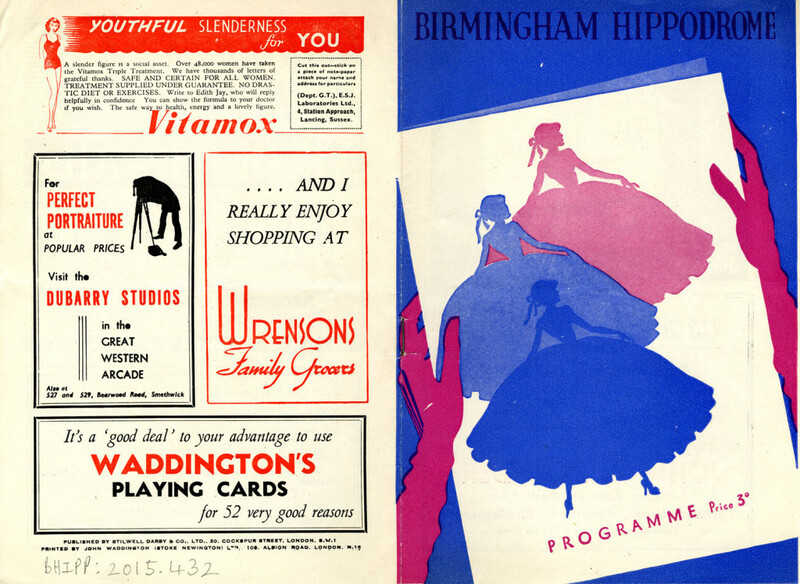 It was the start of a new tradition for Birmingham Hippodrome! 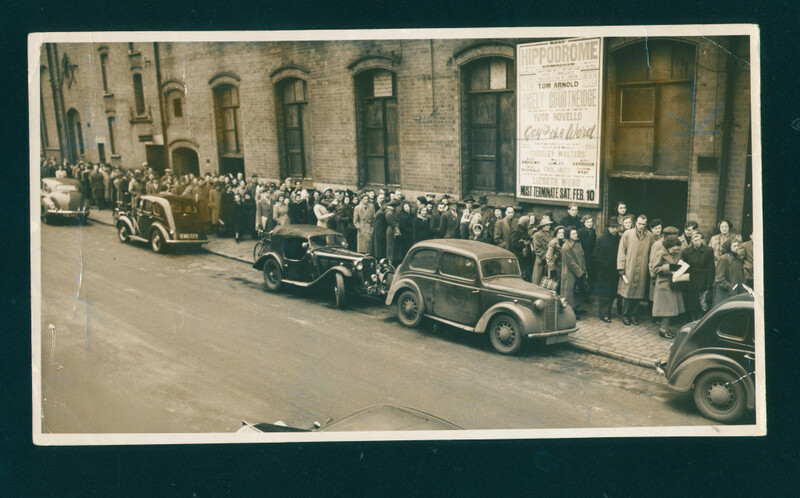 After the Second World War ice shows became very popular. The effect was spectacular and old musicals gained a new lease of life on the ice. The story follows the life of a penniless composer and his love for two women, an inn-keeper?s daughter and an opera singer. This production ran for nine weeks. The queue to book tickets for ?Gay?s the Word? stretched the length of Inge Street! The production was written and composed by Ivor Novello. The cast included Cicely Courtneidge, Elizabeth Webb and Thorley Water and ran for four weeks. The rock and roll fifties was a time of change for variety theatre. Twice nightly variety had run its course and new stars were born through TV and popular music. The decade saw the staging of popular musicals like Rodgers and Hammerstein?s ?Carousel? and in 1957 the first pantomime ?Jack and the Beanstalk?. Birmingham Hippodrome audiences saw Ol? Blue Eyes himself ? Frank Sinatra! The first pop star to appear at the theatre was Tony Crombie and his rock ?n? roll Rockets on 24 September 1956. I will pass on the query to the Heritage volunteers and I will get back to you when I have any information.